While still exploring the infinite boundaries of Planet Earth by stepping through time, steppers Joshua Valiente, Sally Linsay and Lobsang are immersed in the overwhelming cleanup from the eruption of the Yellowstone Volcano five years earlier. It is now 2045, and Earth is rapidly deteriorating from the cataclysmic explosion that has devastated the western United States. The effect of the spreading volcanic ash cloud has decimated human life, crops, livestock, and any hope of restoring civilization to a significant portion of North America for decades or even centuries to come. Now there is evidence that the spreading destruction is beginning to affect the entire Northern Hemisphere, including Russia and Asia. Joshua and Sally join a search and rescue mission to find the last survivors as plans are made to abandon Datum America. Arrangements are being made to transport survivors to stepward colonies that date back to prehistoric times discovered after Willis Linsay invented the original Stepper device in THE LONG EARTH (2012), followed by THE LONG WAR (2013). This simple plaything forever changed the world 20 years earlier. 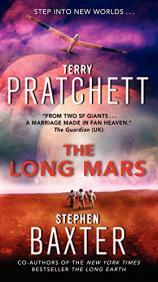 "THE LONG MARS is a collaboration blending Pratchett’s whimsical, sentient beings made famous by his Discworld series and Baxter’s scientifically based sci-fi thrillers filled with technical details and the probabilities and possibilities of deep space exploration. " Sally reluctantly joins Linsay, her estranged father who not only claims to have found a way to travel to Mars through one of the mysterious gaps or soft spots that Sally can sense during earlier stepward exploration, but declares that he has actually been to Mars. Moreover, the stepping device now implanted in a glider will work on that planet. This means that an exploratory party could step back in time on the Red Planet to an era when scientists believe Mars probably sustained life. Would this allow a colony of Earthlings to relocate and build a new world as Planet Earth continues to die? Linsay will join US Navy Commander Maggie Kauffman to launch the most adventurous and dangerous space exploration in history --- a trip to Mars. The small crew’s orders are to search for signs of early life that may date back a million or more years. Linsay will serve as guide and mentor, and Sally will use her natural stepping abilities to assist in the exploration. Harrowing encounters with humanoids of all forms, from a colony of crustaceans with a fearsome ruler to a society of dogs, lend a fascinating alternative point of view to the culture that humans hold dear. Maggie’s proven ability to work with other sentient species as crew members has placed her in a position to head up the exploration team. Fearless in battle and resourceful in utilizing the talents of her crew members during prior campaigns, Maggie adds a member of the canine colony who proves both problematical and advantageous --- and often amusing. The third in the Long Earth series by two brilliant sci-fi authors, Terry Pratchett and Stephen Baxter, THE LONG MARS is a collaboration blending Pratchett’s whimsical, sentient beings made famous by his Discworld series and Baxter’s scientifically based sci-fi thrillers filled with technical details and the probabilities and possibilities of deep space exploration. “What-ifs” are the stuff that sci-fi is made of, and this entertaining novel will pique the imagination of any sci-fi fan looking for a unique approach to the genre. 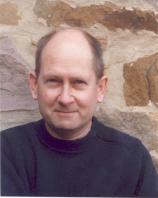 If you’re jumping in now, pre-reading the first two books will be helpful in establishing characters and events. Plus the evolution of a simple child’s toy into a revolutionary space/time travel tool might find you digging in your pantry for a potato. Everyone needs a stepper. THE LONG MARS is an original concept of interplanetary space travel in the near future that was first explored in Pratchett’s THE SCIENCE OF DISCWORLD, published in 1999. The Yellowstone Volcano is currently active and is believed by volcanologists to be potentially the most deadly volcano in the world.